Spot the flower ? 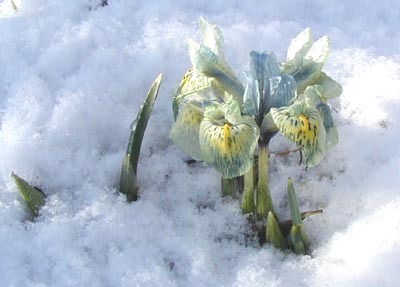 Yes we still have the snow and a lot more of it came this week causing havoc around Aberdeen 140 schools had to be closed on Tuesday, but the bulbs just get on with it. I suppose that they have no choice, it is the 'I've started so I'll finish' principle. 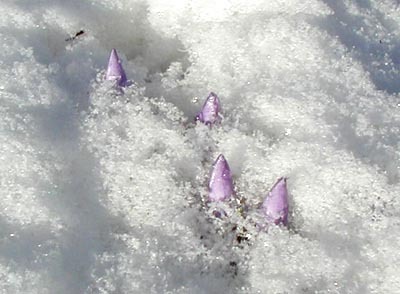 No one is 100% sure what triggers a bulb into growth but once it has started there is no turning back. This is why different clones of the same species will come into growth at different times, it is natures way to increase the odds that at least some of you will flower in favourable conditions. 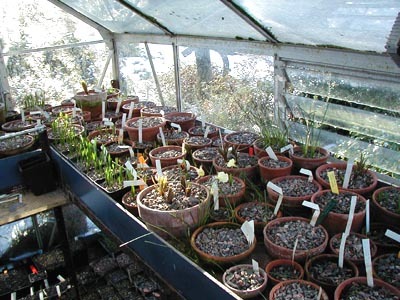 To grow a single clone is to have all your eggs in one basket and growing bulbs from seed ensures that you have as wide a range of clones as possible. Some of our expanding collection of Corydalis are well into growth although it may be a month or more before they flower it all depends on the temperature. We got some very good seed set on all our Corydalis last year by fertilising them with a paint brush. I do not subscribe to them not being self fertile school. I just think that as we have no insects about to transfer the pollen when they are in flower they do not get fertilised, so I do it and it works. These are newly germinating seedlings of Techophilea violacea they were sown half way down this deep pot and you can see that they not only have no trouble getting up to the surface but they already have the same size of growth as two or three year old surface sown seedlings. 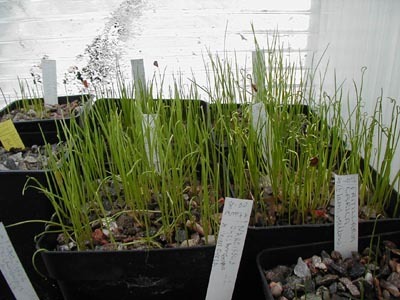 Check out the Bulb log feedback on the forum for more on deeply sown seed. The Frit seedlings seen in an earlier log continue to grow despite the weather but you will notice that some are keeling over. 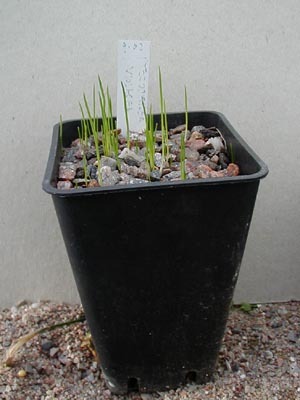 I always sow bulb seed thickly and I expect a small number to root off at this early stage. 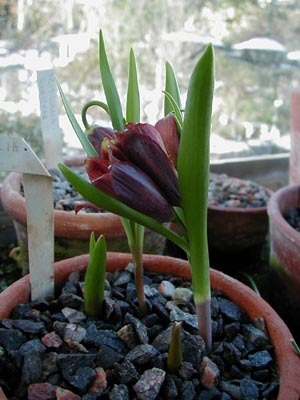 I have a theory that this is the bulbs selecting me and my growing conditions, if they do not like my regime they pop off and it is much less painful to loose a seedling a few weeks old than to loose a mature bulb. 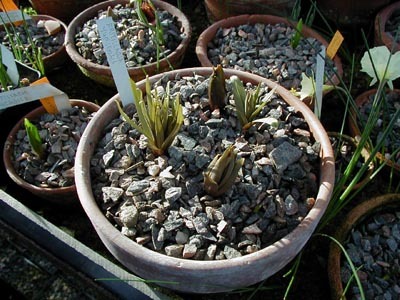 I got some seed of some really good Fritillarias from a friend the other week but rather than sow them now, which I beleive is outside their germination window and the dormant seed is just likely to rot off in our climate, I have stored them in the bulb fridge and they will get sown in September/October with our own collected seed. In the frit house noses are poking through everywhere. 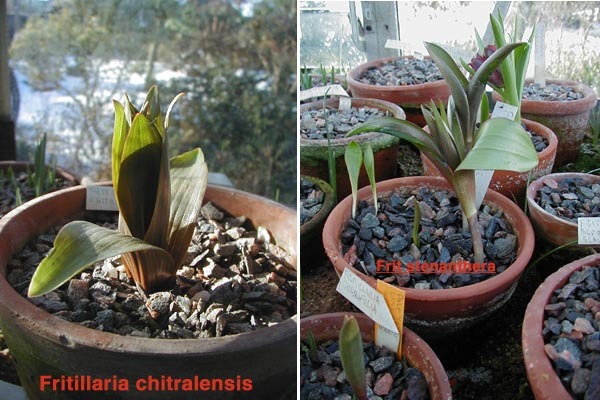 We got our first seed set on F. chitralensis last year despite having flowered it for three years and that seed is germinating now in the seed frames. The single stem had three flowers on it this year as compared to two last year and one the year before, it may be that the plant is just coming into maturity. It would be nice if the bulb would split or produce some offsets. Some of the recently introduced Chinese frits are also very early starters like F. yumiensis, they also make very early root growth often discovered when we repot them in July and sometimes before the old growth has fully died back. We may have to start to repot these earlier to avoid damaging these delicate new roots. I will leave you with the most advanced Frit causacia which is in flower although it will continue to extend for quite a few weeks yet before it is at its best.